Well after a somewhat failed 2011 in gaming land I'm finally getting back into it in a decent way. Much of the impetus for my gaming has come from my long suffering brother. His own blog has reminded me i need to get more painted and a challenge from a work mate has driven me to get the gaming brain back on and find some time for it. So what's the last 12 months brought then? Well for starters I'm now a dad, I've a lovely 4 month old daughter who I've been banned front ever teaching to game. Thus had some what constrained hobby time and so i had to make sonera cuts and eventually ditched other hobbies in favour of gaming and painting. This last year has also brought me a new gaming buddy, with young daughter and not living that close to any gaming clubs this is a bit of a blessing. James is however interested in GW games so I'll have to beat that out of him. 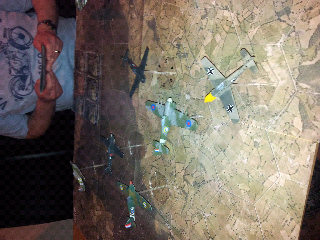 We've mainly been playing through relatively new angels20 from axis and allies miniatures, its a surprisingly good little game. The rules are a bit better thought out than most pre painted cmg games but simple enough we managed to get a good grasp of them in the first session. Pic below of one of our games. Bye for now but I'll be back soon with updates from other projects.